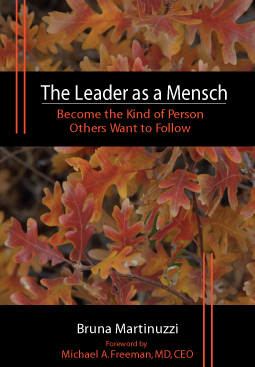 Bruna Martinuzzi’s new book, The Leader as a Mensch: How to become the kind of person others want to follow, it now available from Six Seconds EQ Press. The book offers wonderful insight, advice, and inspiration for leaders and any who is committed to the notion that leaders should first be people worthy of followers — people of integrity, character, compassion and wisdom. Every once in a while a book is written that is as rich with heart as it is with skills and applications. This book is a must-read for anyone who has come to grips with the fact leadership is not about exercising authority. It s about setting a clear example. Every reader can find something for themselves to work on in this soon to be business classic. — Joseph Gibbons, Ph.D., The FutureWork Institute. This insightful and engaging book speaks volumes on ways in which all of us, at any level, can improve our leadership impact and develop the humility, integrity, and honor that instills hope and confidence in others. Drawing on over 25 years of leadership experience, Bruna Martinuzzi brilliantly conveys the essential guidelines for the emotionally intelligent leadership needed for enduring success. Some leaders are exceptional human beings, people that others genuinely want to follow; the book uses the Yiddish word Mensch, meaning “real person of character” to describe these worthy leaders. Martinuzzi takes the reader on a transformative journey to a way of living, self-discovery, and personal strength that translates into becoming a person who authentically inspires with empathy and confidence—and successfully motivates others to follow by example, a mensch-leader.